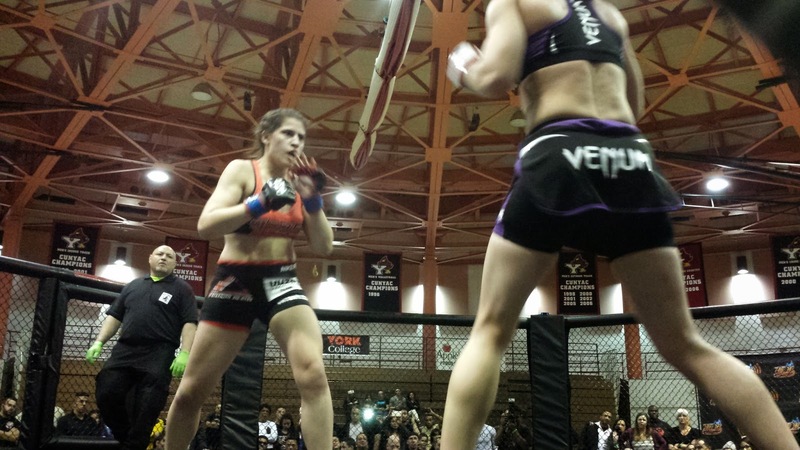 Aggressive Combat Championships ended 2014 with a bang on Saturday night, with their fifth and final installment of the year bringing together two ultra-talented female fighters in the cage and letting them battle it out for a championship title. In a very competitive three-round war, Jillian DeCoursey and Hannah McGuckin did 115-pound fighters everywhere proud as they struggled to impose their respective wills on each other - and for both ladies, who hail from strong grappling schools, that "will" involved finding the dominant position on the ground. Ultimately, it came down to the third round and who could gain the advantage, and that ended up being DeCoursey, who trapped McGuckin against the cage and rained hell from above. DeCoursey took the decision and the strawweight belt, but the sheer competitiveness of the bout means that McGuckin is still most certainly in the mix in any title discussion. Christian Medina ended up being on the more promising talents Aggressive uncovered in 2014, and on Saturday night he got to show why. Taking on a very hard-to-submit veteran in Florentino Laureano, Medina employed near-flawless jiu-jitsu to fire off sub after sub. To his credit, Laureano almost survived to the third round - almost - but eventually Medina caught him. It took more than a few might swings of his axe, but eventually Bryant Johnson was able to chop down the sturdy oak that is Tino Nepolditis. While attempting to combat Nepoliditis' reach with some stick-and-move, Johnson soon found a sweet spot for his low-kicks in Nepolditis' thigh, and by Round 3 he had sufficiently chipped away at it to the point that the taller man was almost hobbled. From there came the ground assault and the TKO, which for Johnson meant an impressive win over very solid opponent. With five solid events in 2014, Aggressive's output alone puts them ahead of the pack when it comes to Big Apple fight shows. The fact that they're a well-oiled machine with high production values, and that they've established themselves as a great platform for amateurs looking to get a taste of regulated fist-fighting... well, that's just the icing on the combative sports cake. Thanks to Aggressive, 2015 should be a good year.